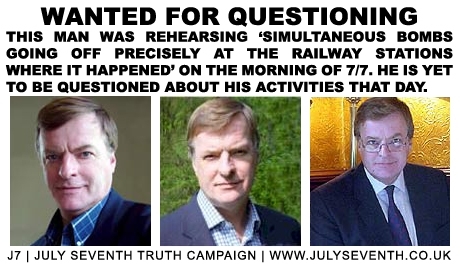 The 7/7 Terror Rehearsal Aside from his connection to 7/7, Peter Power has a long and interesting history of involvement with terrorist incidents in London and with disasters on the underground. His distinguished career includes being deputy forward controller at the scene of the shooting of WPC Yvonne Fletcher, an incident that occurred during the Libyan People's Bureau siege, as well taking a senior role in the Oxford Circus underground fire and the King's Cross station fire operations. Update 07/02/08: J7 Exclusive Report: Peter Power's CV Fakery - 7/7 terror rehearsal man and regular BBC 'terror' consultant was suspended from Dorset Police pending an internal inquiry that resulted in a file being sent to the Director of Public Prosecutions. Full story here. Aside from his connection to 7/7, Peter Power has a long and interesting history of involvement with terrorist incidents in London and with disasters on the underground. His distinguished career includes being deputy forward controller at the scene of the shooting of WPC Yvonne Fletcher, an incident that occurred during the Libyan People's Bureau siege, as well taking a senior role in the Oxford Circus underground fire and the King's Cross station fire operations. Woman Police Constable (WPC) Yvonne Fletcher (1959–17 April 1984) was a British policewoman who was shot and killed in London's St James's Square during a protest outside the Libyan embassy. The shooting resulted in a siege at the embassy which lasted for eleven days, as well as the breakdown of diplomatic relations between the United Kingdom and Libya. She was the first policewoman to be murdered while on duty in Britain. 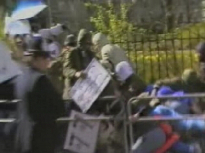 Eleven anti-Gadafy demonstrators were injured in the volley of gun fire. WPC Yvonne Fletcher was also shot and, although rushed to Westminster Hospital, died soon after arrival. Peter Power was the deputy forward controller at the Libyan People's Bureau siege at which WPC Yvonne Fletcher was shot. Fletcher's murder would later become a major factor in the then prime minister Thatcher's decision to allow U.S. President Ronald Reagan to launch the USAF bombing raid on Libya in 1986 from American bases in Britain. In April 1996, 12 years after the killing, Britain’s Channel Four flagship documentary programme Dispatches - in a massively researched broadcast, Murder at St James's, that cited credible and experienced sources - revealed that Fletcher had been murdered by elements of British and American intelligence. Disgracefully, these astonishing revelations went unreported by the media in much the same way as many crucial revelations about the events of 7th July 2005, such as Peter Power's simultaneous terror operation and the many factual inaccuracies, inconsistencies and curious anomalies in the official story of July 7th have also gone virtually, if not totally, unreported and unchallenged. Issues raised by the Dispatches programme about the killing of WPC Fletcher were later raised in Parliament by Tam Dalyell on 8 May 1996. Mr Dalyell qualified before Parliament that the programme had been exceptionally well researched and that it had featured the statements from people whose calibre and relevant experience was beyond question or compare. 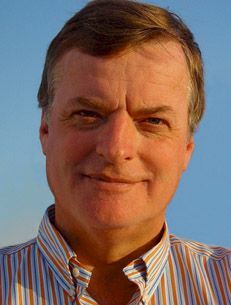 Contributors to Dispatches included a senior ballistics officer of the British Army, Lieutenant Colonel George Styles, and Dr Bernard Knight, a senior and distinguished Home Office pathologist. MP Tam Dalyell raised a total of eight separate issues in relation to the murder of WPC Fletcher, including that Yvonne Fletcher appeared to have have been shot from a different direction than that alleged; that huge discrepancies existed between the reports of pathologist Dr Ian West whose post mortem report differed significantly from his analysis presented at the inquest; and that WPC Fletcher's injuries could not have been caused by the alleged combination of gun and firing position. When the makers of 'Murder at St James's', Fulcrum Productions, attempted to interview the pathologist, Dr Ian West, about the inconsistencies in his reports, he cancelled two appointments and then refused completely to meet. In response to Mr Dalyell's inquiries in Parliament, the Minister of State for the Home Office, David Maclean, dismissed the Dispatches programme simply as "preposterous trash". The ongoing controversy surrounding Fletcher's death resulted in the current prime minister, Tony Blair, being questioned by former MP Tam Dalyell in parliament on 24 June 1997. Mr Dalyell received a similarly unenthusiastic response from the State as he had on previous occasions. In 1998, 14 years after the killing, the murder of WPC Fletcher was still being cited as the sole reason for maintaining trade sanctions against Libya by Jack Straw on behalf of the Labour government. Following the shooting of WPC Fletcher, the then Home Secretary, Leon Brittan, immediately ordered an investigation. The results of that investigation have never been divulged to the British public and have remained one of many State secrets kept from the public. Perhaps the deputy forward controller at the Libyan People's Bureau siege, Peter Power, might able to shed some light on exactly what happened in the case of the killing of WPC Yvonne Fletcher, as well as during his terror rehearsal operation in London on 7th July 2005. During the Oxford Circus fire incident of 1984, a crisis situation that earnt Mr Power the title of 'Pied Piper of the Underground', Power commandeered an underground train on which he happened to be travelling, lied to passengers over the train's tannoy system about the severity of the situation that faced them before giving the train's driver "a certain bit of advice to his face" after which the driver, "was knocked out". See the BBC On This Day reports "1984: Oxford Circus fire traps hundreds" and, "1984: 'Pied Piper' of the Underground" for more information on these incidents. On 18 November 1987, a flash fire engulfed an old wooden escalator at the King's Cross underground station. Thirty one people perished in the disaster including a firefighter - Colin Townsley, station officer from the Soho Fire Station in central London. Two other firefighters were trapped on the station platform but survived. You can see a short ITN News at Ten report of the King's Cross fire here. At around 9:45pm on 20th September 2000, an explosion was reported in central London at the headquarters of Britain's secret service, MI6. Initially it was unknown whether the explosion had occurred inside or outside the building and firefighters say they werecalled to attend the scene at Vauxhall Cross at 9.52pm. A rocket launcher was later found and no group ever claimed responsibility, although suspicions pointed the finger at the Real IRA. After the MI6 rocket attack, Mr Power was again quoted by the BBC. To date, despite the device used to launch the attack being found in Spring Gardens, nobody has ever been charged for this attack, although it was intimated at the time that Irish Republican organisations might be responsible. This begs many questions about who might be be capable of perpetrating a rocket attack on a building as high-profile as the MI6 building and be allowed to get away with it. Short and sweet if nothing else. Never since mentioned in Parliament. Peter Power also has connections to former New York Mayor, Rudi Giuliani; he served on the Advisory Board to the Canadian Centre for Emergency preparedness (CCEP), alongside the senior Vice President of Giuliani and Partners, Richard Sheirer, who was also Director of the New York Mayor’s office of Emergency Management, overseeing the rescue and recovery operations following the September 11th attacks. Giuliani and Partners is itself both a security consultancy and Investment Bank and Mr. Giuliani himself, by another strange coincidence, also happened to be in London for a conference and just yards away from Liverpool Street station when the blast occurred there on the morning of July 7th. Mr Giuliani was mayor of New York at the time of the 9/11 and his emergency bunker was destroyed at 5:30pm that day whenWorld Trade Centre building 7 mysteriously collapsed, despite not having been hit by a plane. How much more do we know now? In short, very little was known for over three years. Neither Peter Power, nor any other representative of Visor Consultants, had been publicly quizzed about the exact nature and extent of their operation that morning, despite the extremely bizarre coincidence of them running a rehearsal "based on simultaneous bombs going off precisely at the railway stations where it happened." Three years, however, appears to have been the watershed. My name repeatedly comes up whenever armchair / conspiratorial thinkers consider the terrorist exercise my company ran in London at exactly the same time as 7/7. This is only the second time I have formally reacted to these numerous statements. I’ve also appeared many times on BBC News / Newsnight to explain post 9/11 & 7/7 concepts such as ‘new normal’ etc. I think anyone familiar with likely terrorist targets will release [sic] our exercise scenario was coincidence rather than conspiracy, but it does start to raise some interesting points on a wider scale. Several features now exist to create a much more generic and all-hazards approach to numerous risks and threats that are uniquely starting to appear on the global / corporate radar screen irrespective of country, culture, geography or sector. Some of these are already occurring such as a new form of terrorism that has no ‘political’ objective, theeffect of high volume and unrestricted information on the internet, spread of disease / mass travel (230m people passed through UK airports last year / all major air hubs are less than 72 hours apart), ineffective world leaders & UN, the consequences of accelerating global warming, the positioning of key essential / physiological supplies (Critical National Infrastructure – CNI - UK) in the private sector (e.g. electricity, water etc.) and an associated failure to understand how vital the private sector is not only in terms of employment, economy and wealth generation, but to maintain almost the entire CNI in most if it not all countries. In several cases these threats and risks combine to create a series of problems that we are presently unable to deal with as a result of silo based attitudes, incompetence, proprietorial behaviour or just complacency. There is I suggest, a need to start building a new approach based on conceptualising and hopefully influencing others since we are presently lacking a truly forward thinking and pan global collective body of influential advisors, practitioners and academics that transcends the otherwise valuable but discrete institutions in many countries and their individual agendas. It might just inform many others as to what terrorism is all aboutand get them to think twice before alleging my own company was some how implicated in 7/7. My aim is to help stimulate, collaborate and disseminate effective and non partisan advice without the handicap of parochial restrictions, silo constraints or inhibited vision. Another ten months were to pass before any further comment was made by Peter Power, prompted by his involvement with a particularly pathetic and insulting episode of the BBC's Conspiracy Files on the subject of 7/7. It is worth noting that J7 categorically refused to have anything to do with the production of the Conspiracy Files and a copy of our missive to the BBC explaining why can be found here. The BBC had originally planned to broadcast its Conspiracy Files 7/7 episode in June 2008, however these plans were scuppered somewhat by the CPS bringing a prosecution against three acquaintances of the four men accused of perpetating the attacks of 7 July 2005, thereby rendering the matter sub judice. Despite much anticipation and fervour about the expected fait accompli outcome of the trial, the jury failed to reach a verdict, even though the judge had lowered the bar and offered to accept a majority verdict of 10 to 2. Unfortunately, the BBC have just postponed a programme in their ‘conspiracy files’ series that would have done this. Our client three years ago agreed to be named in the BBC programme since the attitude of the producer and his team was very balanced (several conspiracy theorists were also invited to take part). We even allowed our complete exercise material to be made available to the BBC. Regrettably broadcasting it now might jeopardise an ongoing court case, so they had little choice about postponing it to next year. Of just eight nearby tube stations that fell within possible exercise's scope, three were chosen that, by coincidence, were involved in the awful drama that actually took place on 7 July 2005. A level of scenario validation that on this occasion, we could have done without. it relies on the fear of the bang." If you have any additional information about any aspects of the anti-terror rehearsal operation run by Peter Power and Visor Consultants on the morning of July 7th, please get in touch.